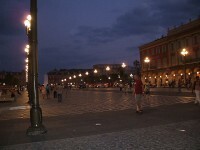 Nice, the most resplendent city on the French Riviera, is a favorite target of the tourist hordes that take the coast by storm in summer. 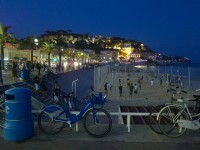 Thousands of foreign and domestic tourists come to Nice to enjoy their summer holiday, because this city simply has it all. Some of the bluest waters and loveliest beaches on the Riviera are located near or in Nice, and the city has more than enough museums and historical attractions to keep your afternoons busy. With your daytime hours taken care of, you will need to think about what you’ll do in the evening – and Nice has countless options on the offer,. Nice’s nightlife is lively and varied, and whether you like loud clubs or stylish lounges, you will find a place for the evening. 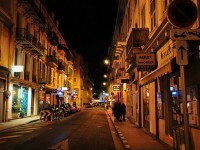 Here’s a guide to nightlife in Nice to get you started. L:e Ghost in the old quarter of the city is the favorite hangout of the city’s cool crowd, who lounge and chat early in the evening, but become livelier and louder as the evening wears on. The decor is very stylish, with low lighting and black and red furniture and walls – the sort of place where you can sit on a sofa and sip on red wine all evening if you feel like it. The DJ that play music later in the evening have a classy and eclectic selection. Cours Saleya in Old Nice is one of the most interesting spots in the city, but at night it gets even more interesting as the bars open. Les Trois Diables is one of the most popular venues in the old part of the town, and it is a great place for dancing if you enjoy the rhythms of trip hop and electro. The club is small and it has a regularly cool and hip clientele. La Palousa is said to be the largest nightclub on the French Riviera, and indeed this three story club has more than enough space for everyone who cares to drop by. No guide to nightlife in Nice could miss out the hippest club of the city, which doubles as a restaurant early in the evening. The club serves famously good cocktails and a wide selection of tapas. Bar des Oiseaux is the perfect place if you want to immerse yourself into the local scene. This is no simple bar, as it also functions as theater and music venue, and it is a great spot for hearing some of great live French music. Bar des Oiseaux has a slightly older and polished clientele, who enjoy jazz concerts, stand up acts and other more culturally oriented nightlife entertainment. If you like to dance but you don’t want a rowdy, loud club, then you should head to Guest on the waterfront, which is full of couples and people who want to see-and-be-seen. This is one of the most chic and trendy clubs in towns, and if you dress to impress you will most likely end up catching someone’s attention.